Steve Cable examines how people with advanced degrees match up to the populations as a whole in their denominational affiliation and basic religious beliefs. A colleague asked me, “Do you have any recent research—insights—into the religious beliefs of professors?” After some deep digging, I was surprised to see that advanced degrees may not change basic religious views like many believe they do. The simple answer is no. I have not found any survey data that I can access that focuses on college professors. However, since the question was asked, I wanted to look at the 2014 Pew Religious Landscape Study which surveyed 35,072 Americans to see if I could extract any data that would provide any insight into the religious beliefs of professors. Unfortunately, there are no employment questions in the survey and the level of education question does not separate Ph.D.s from master’s degrees. However, I did get some interesting information about the highest level of education asked about in the survey: What is the highest level of school you have completed or the highest degree you have received? Postgraduate or professional degree, including master’s, doctorate, medical or law degree (e.g., M.A,, M.S., Ph.D., M.D., J.D., graduate school). I wanted to see how religious affiliation and religious beliefs compared with the population as a whole; i.e., did having a graduate degree make one more or less likely to be religious? First let’s look at their self-proclaimed religious affiliation as shown in the figure below. The color key shows age range and cohort (i.e., representing all survey takers or only ones with advanced degrees or “Adv Deg”). The sum across each color for the first five categories adds up to 100%, i.e. for all 25 to 34 year olds, 27% are evangelicals, 12% are mainline, 16% are Catholic, etc. adding up to 100% of the population. Atheists are a subset of AAN and were added for their relevance to the question. 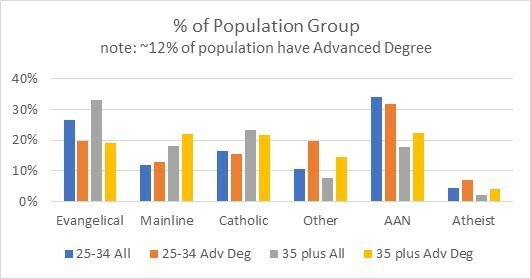 First, note that for Mainline Protestants, Catholics and AAN’s, those with advanced degrees are essentially identical in percentage as the age group as a whole. Only for Evangelicals and Other Religions is there a significant difference. Those respondents with advanced degrees are a significantly smaller segment of the population for Evangelicals and a significantly larger segment for Other Religions. It is not surprising to find that a greater percentage of those with advanced degrees are followers of a non-Christian religion than for the population of non-Christians as a whole. This result is because a great portion of immigrants to the U.S. with a Hindu or Muslim background are professionals with advanced degrees brought in to fill engineering and computer science positions. It is interesting that for AAN’s, those with advanced degrees are about the same percentage of the population as those without advanced degrees. What about their religious beliefs? These are compared in the figure shown here. The primary take-away from the chart is once again the striking similarity between the religious group as a whole and the religious group comprised of those holding advanced degrees. 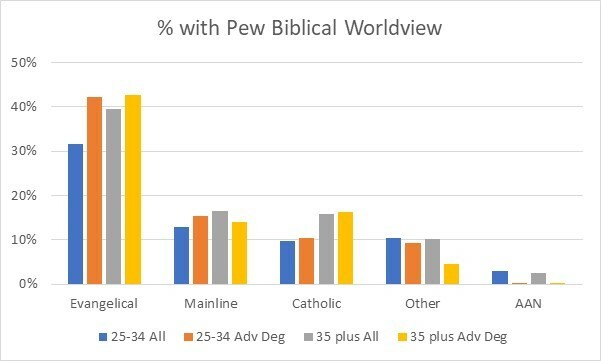 It is interesting to note that Evangelicals with advanced degrees are somewhat more likely than Evangelicals as a whole to ascribe to the Pew version of a Biblical Worldview. Remembering that the first chart shows a drop-off in the percentage of Evangelicals with advanced degrees relative to the overall percentage of Evangelicals in the population gives us a reasonable clue as to the cause: perhaps those people who completed their advanced degree and still considered themselves Evangelicals were more conscious of what that means than the population at large. I thought you might be interested in this data. However, it really sheds little light on the questions about college professors because college professors are a small percentage of the pool of people with advanced degrees in America. One study that does provide data on this question was done in 2006 by two professors. It appears to be a well-done attempt to look specifically at college professors. It supports the view that many college professors (particularly at top-tier universities) are not supporters of and in many case actively ridicule evangelical religious thought. Note: “many college professors” does not mean a majority but rather a significant minority large enough that one could not spend four years at a university without spending semesters in several of their classes. It would be nice if there were a similar study from 2016 so we could see the trends between 2006 and 2016. In summary, looking at recent survey results, we do not find a significant difference in the percentage of people who self-identify as Atheist, Agnostic, or Nothing at All who have an advanced degree relative to those without an advanced degree. However, there is a significant fall off in the percentage of Americans with advanced degrees who identify as Evangelicals. At the same time, those with advanced degrees who affiliate themselves with an Evangelical denomination are more likely to hold a biblical worldview than those without advanced degrees. These five positions have some wording issues from an evangelical perspective, but Pew selected the possible answers and these five come as close as possible within their question structure to reflecting a partial biblical worldview.